Note: This is not a full holster. You must either own a Shift Shell or purchase one separately to carry as a full holster. •	Is specially molded to the ankle with materials for lasting comfort and concealment. •	An exclusive design consistently holds the holster in place to stop movement and sliding down. •	Enjoy cross compatibility with a variety of other IWB and OWB holsters to save big bucks. Expand your ShapeShift Modular Holster System with the comfortable, concealable ShapeShift Ankle Carry Expansion Pack. The ShapeShift Ankle Carry Pack has an all-new formfitting design, unlike anything on the market. Made of an upper and lower strap, this holster combines breathable CoolVent™ neoprene for comfort with thermo elastomer and premium engineered polymer for stability. The design of the ankle carry pack draws support from the heel and the base of the ankle, compared to other holsters that have calf braces and garters that slide down throughout the day. The size of the holster is highly adjustable and offers six ride height levels. 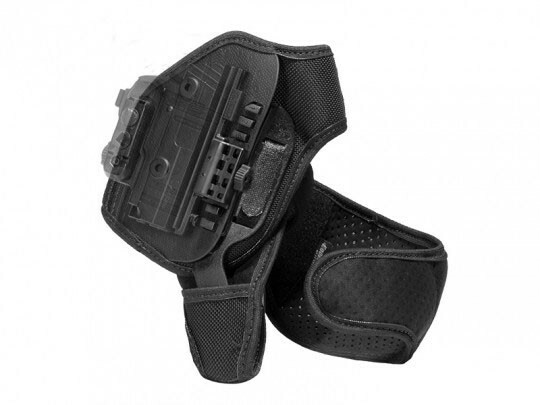 The Ankle holster can be relied on for a fast, unobstructed draw. With the separately sold shell, the retention locks the gun into the holster with an open mouth design, so you only have to pull up your pant leg and draw your firearm in one quick motion. Other holsters rely on a thumb strap to contain the firearm, which adds precious seconds onto your draw. Because the Ankle Carry Expansion Pack is made with lightweight, plush CoolVent™ neoprene and low-profile hook and loop fasteners, the need for bulky padding is removed and the entire structure is more streamlined for improved concealment. This also means any size of firearm can be worn on the ankle with the shell attachment; the holster is not limited to compact or micro models. The materials of the Ankle holster are also ready to be worn immediately, right out of the package with no break-in time. Combine this expansion with any of the other ShapeShift Holsters for more options at half the price. The purchase of this expansion pack comes with the peace of mind of a Forever Warranty. Try this American-made holster with our 30-Day Test Drive, and return it if you’re not completely satisfied.